Thanksgiving beckons us to dust corners, polish silver, and iron the big tablecloth. Although food magazines are tempting us with new takes on standard fare, my table will again offer a free-range turkey done up with trimmings we’ve come to expect. Still, I’m always willing to navigate waves of new tastes when it comes to appetizers. On a recent Saturday, I cooked with a lively group of women and sampled four trendy party bits that would greatly enhance a Thanksgiving spread. We savored tiny Swedish Meatballs with Cranberry Sauce, bite-sized Butternut Squash Empanadas, and Spicy Wilted Baby Kale on toast with goat cheese. I also did a Midwestern spinoff on the famed London chef Yotam Ottolenghi’s Roasted Eggplant with Tahini and Pomegranate. Ottolenghi’s eggplant dish, brilliantly colored with parsley, pomegranate and blobs of Greek yogurt, gives off holiday sparkle. Surrounded by crisp cucumber slices for dipping, it meets criteria for something lighter, something vegetarian—if you leave off the yogurt, it’s vegan. The basic dip can be made two days in advance; it’s best at room temperature and can be fully plated hours ahead. Before you indulge in your traditional turkey feast, why not dip into veggies! Roast eggplants in 450º oven for 20-30 min. or broil 15-18 minutes, turning once. Eggplants should be collapsed, totally tender and burst. When cool enough to handle, split and scoop out flesh. Drain eggplant flesh in strainer 30 min. Mash garlic and chili with salt in mortar or on a board. Mix with tahini and gradually beat in water to form a white cream. Blend in pomegranate molasses, lemon juice and green onions. 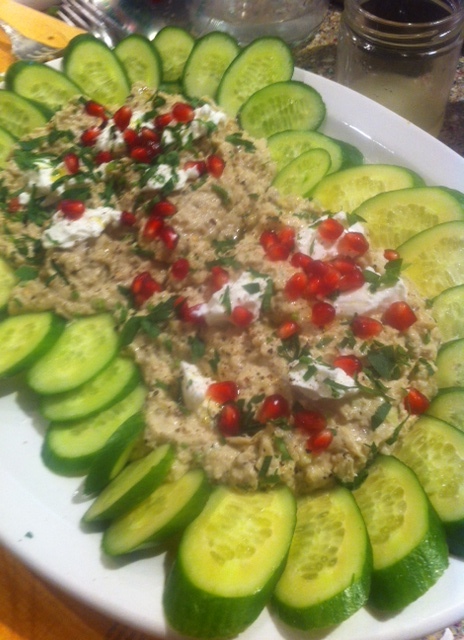 Chop eggplant and add to the tahini cream along with most of parsley. Taste for seasonings adding more salt or lemon as necessary. Chill several hours. Mound in serving dish, dollop over yogurt, sprinkle with parsley, pomegranate seeds and grind on black pepper, then drizzle with olive oil. Serve as dip with cucumber slices. Enough for 10-12. You are currently browsing the Mary Jo's Kitchen blog archives for November, 2013.